Sail from the new yacht base at Sivota, on the south eastern side of Lefkas Island and visit Kefalonia and Ithaka as well as some of the smaller and more traditional islands and mainland destinations. Each island, harbour and town has its own character, from cosmopolitan Fiskardho, traditional Lefkas to sleepy Kastos and the pine-clad bays of Meganisi, you are spoilt for choice and there is something for everyone on an Ionian flotilla holiday. Swim in iridescent waters, explore timeless villages set amongst olive groves and vineyards, and indulge in the tastes and flavours of native Greece in traditional tavernas and lively bars. It’s a wonderful fusion! Sunday Sivota, Lefkas Island - Fly UK to Preveza and transfer to Sivota harbour for yacht embarkation. Previously a small fishing harbour, Sivota retains its charm whilst serving as an excellent base from which to explore the southern Ionian islands. Enjoy great tavernas, useful supermarkets for provisioning and gentle walks around the waterfront. Monday Vasiliki (10nm)- Vassiliki is renowned as a top windusrfing destination, but is now a hit with yachties too – and the brand new marina for 2019 is a great destination. 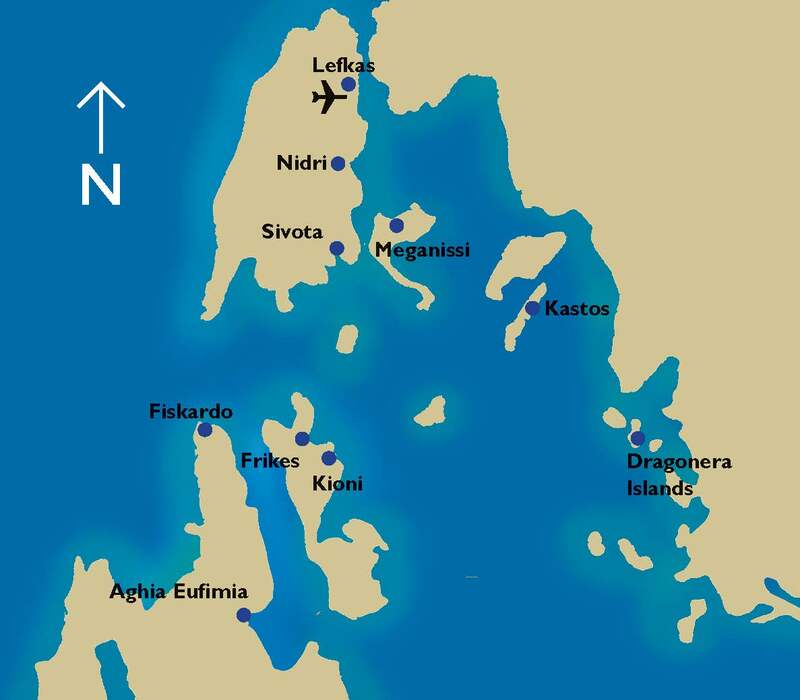 Tuesday Fiskardho (12 nm) – Chic and cosmopolitan, FIskardho is known for being a "must see" destination in the Mediterranean. Some of the best restaurants in the Ionian offer the chance to dine in style. Wednesday Frikes (10 nm) – Frikes is a very well known and popular spot on the eastern coast of Ithaca, and is home to arguably the best restaurant in the Ionian, as well as a fantastic bar for some evening down time from sailing. Thursday Sparthori, Meganisi Isalnd (14 nm) – Spartohori village is set on the hill overlooking the bay, and the view (and a cold beer!) and the rewards for a short climb. Friday Free Sailing – Plenty of choice for you to - Meganisi alone offers 4 or 5 possible destinations, town quay, restaurant quay, long lining in a bay or swinging on the anchor - your crew will suggest the perfect stop for you. Saturday Sivota, Lefkas Island - Return to Sivota on Lefkas island and enjoy a "last supper" together on the waters edge. Two week clients continue free sailing - your crew will be happy to guide you to some of the hidden gems for your weekend. Sunday Sivota, Lefkas Island - Fly UK to Preveza and transfer to Sivota harbour for embarkation. The home port is in a sheltered bay on the southeastern side of the island of Lefkas, perfect for exploring the South Ionian. Monday Vathi, Meganisi (5 nm) – A short hop on our first day is perfect - plenty of time to get used to your yacht and enjoy a swim stop for lunch before the evening punch party on the quay. Tuesday Palairos, Mainland (9 nm) – This small mainland village is popular with Greek tourists and offers a great selection of tavernas for your evening meal. Anchor outside the harbour or on the quay, the choice is yours. 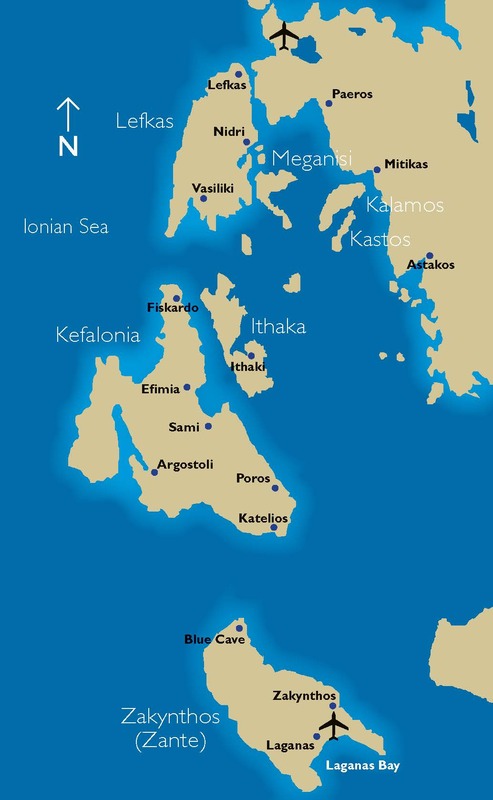 Wednesday Kalamos (13 nm) - Today we head south to the mountainous island of Kalamos. You can be guaranteed some great sailing breezes in the afternoon before heading into the well-protected harbour and dinner and George’s famous taverna. Thursday Port Leone (8 nm) – A short hop to the location of our beach party on Kalamos means plenty of time to explore or relax - head south to the Dragonera islands, great for spotting dolphins, or take it easy, sailing around Kastos with a lazy stop for lunch. Friday Free Sailing - Plenty of choices for your free sailing - head to Meganisi for a night in one of the bays on the north coast, or alternatively head south west to Ithaka or Kefallonia. Saturday Sivota, Lefkas Island - Return to Sivota and enjoy a "last supper" together on the waters edge. Two week clients continue free sailing - your crew will be happy to guide you to some of the hidden gems for your weekend. Flight inclusive packages are available through Sunscape with departures on Sunday mornings with a choice of flights available from Gatwick, Manchester, and Birmingham, to Preveza with afternoon return flights. Flight Time 2 hrs 40 mins. Direct road transfers from Preveza Airport to Sivota Yacht Base take approximately 1 Hour.